This design combines two of Michael’s favorite sources of inspiration: traditional quilt designs and fast, fun, twisty string-art stitches. The name of this design is steeped in the ancient legends of “the Valley” where Michael lives. According to these legends, the name “Shenandoah” means “Daughter of the Stars” in the language of the original Native American inhabitants of this area. The Shenandoah River, the Shenandoah Valley, and the Shenandoah National Park are all near Michael’s home. 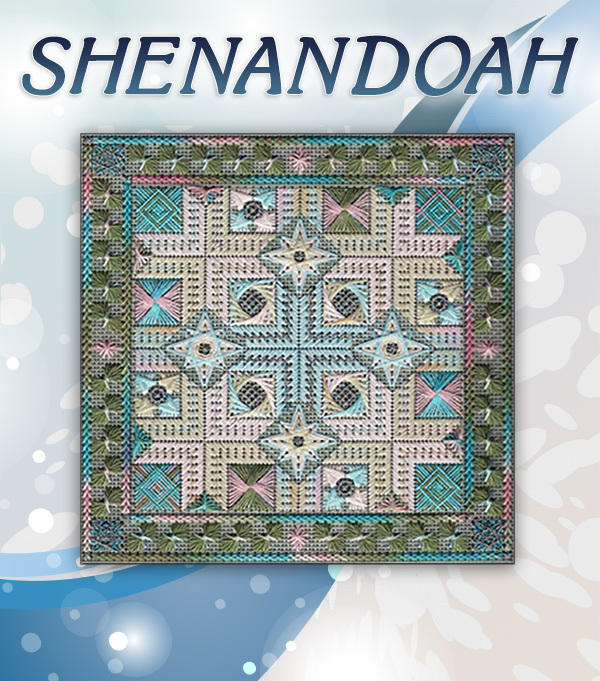 Shenandoah is an intermediate-level counted canvas design. The working canvas is 13” square, and the design itself is about 7” square.